I have a message to share with you. Some people use books or key note speeches as a vehicle for their message. I use music and performance. Music and theatre are powerful tools. They touch us in a way that penetrates the heart and reveals truths, even when other methods cannot. I use the arts to communicate my message. It is the same message I teach my clients, students and readers though my writings, workshops, wellness sessions and space consultations. So, I invite you to experience this message through Kirtan music and Theatre. Are you seeking a meditative practice, but silence isn’t your game? Maybe you’ve tried meditation but you find yourself too restless or you end up falling asleep. Perhaps you would enjoy the company of community, while you connect with your inner voice. Join me for Kirtan—a conscious music experience--that will open your heart and energize your spirit. 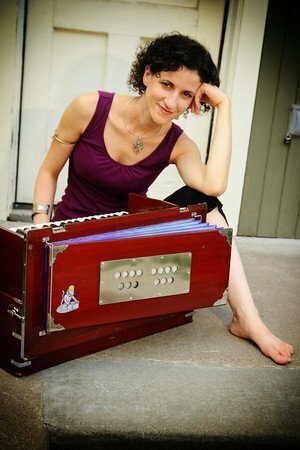 Kirtan is a sacred music experience that comes from the yoga tradition. As such, the songs or “chants,” which are melodic, are sanskrit mantras intended to harness aspects of our own divine natures. 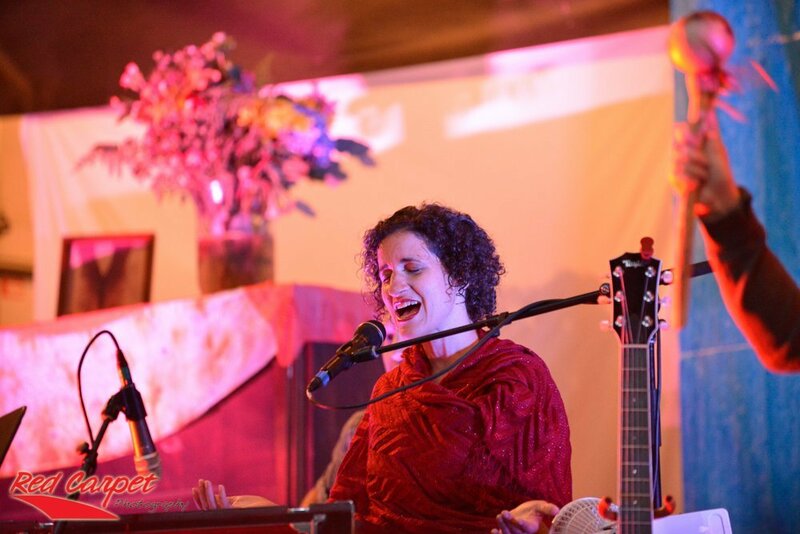 Kirtan is interactive; participants are invited to sing along with the kirtan musicians. It is through that interaction that you feel your mind relax, your heart open, and you feel a connection to the people around you. To find out more about my kirtan band, Sitara & Kalyani with Pavan Kumar, visit our band website. Sitara & Kalyani with Pavan Kumar have led Kirtan at many events including: Midwest Yoga and Kirtan Fest, Rocky Mountain Kirtan Summit, Bhakti Fest Midwest, The Twin Cities Kirtan Festival, The Twin Cites Yoga Festival, Milwaukee Kirtan Festival, Project Earth, Harvest Fest, The Santa Fe Kirtan Festival, Bella Madre and Shangri La music festivals, as well as many venues across the country. 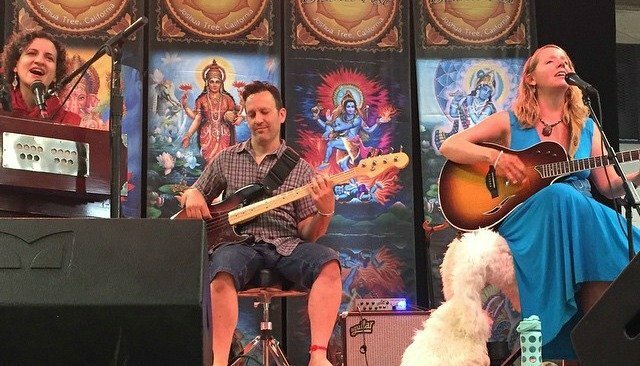 They have also had the pleasure of playing with kirtan greats Dave Stringer, Brenda McMorrow, Mike Cohen and Suzanne Sterling, as well as opening for Trevor Hall at the Common Grounds Yoga & Music Festival. They have also opened for Sean Johnson & the Wild Lotus Band and Grammy Award winning artist, Chris Berry. 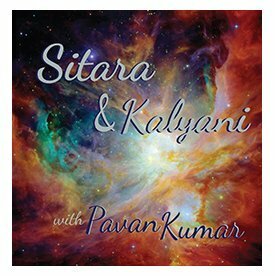 As recording artists, the band released their first collective Kirtan album, self-titled Sitara & Kalyani with Pavan Kumar. The initial “Om” on their premier release is astonishingly strong and moving. Followed by the drone of the tampura into a lovely aarti (devotional song), Sitara (Susan) and Kalyani are powerful chanters. Experiencing music and theatre can be powerful tools for personal transformation. Whether a comedic story, a dramatic monologue or a musical theatre ballad, I believe all art can be sacred and impactful. It’s all about intention and language. 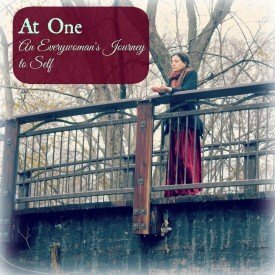 At One, an Everywoman’s Journey to Self, is a one woman show, available for booking, that follows the life story of Professor Katrina Parker on her self-discovery journey, as she moves toward joy by dismantling the life patterns that have brought her suffering. The show is co-created by Lindy Wiens and Susan Shehata through HeartPlays. Written by Lindy Wiens. Performed by Susan Shehata. What an inspiring time for me, last night, taking in your performance. The synchronicity of messages coming to me these days in stillness is a quiet yet explosive joy in and of itself! Through 'At One', I thank you for showing possibilities and holding a torch for myself and others to see and follow. You and Lindy are doing a powerfully wonderful healing with this work. I look forward to experiencing more! ~R.R. 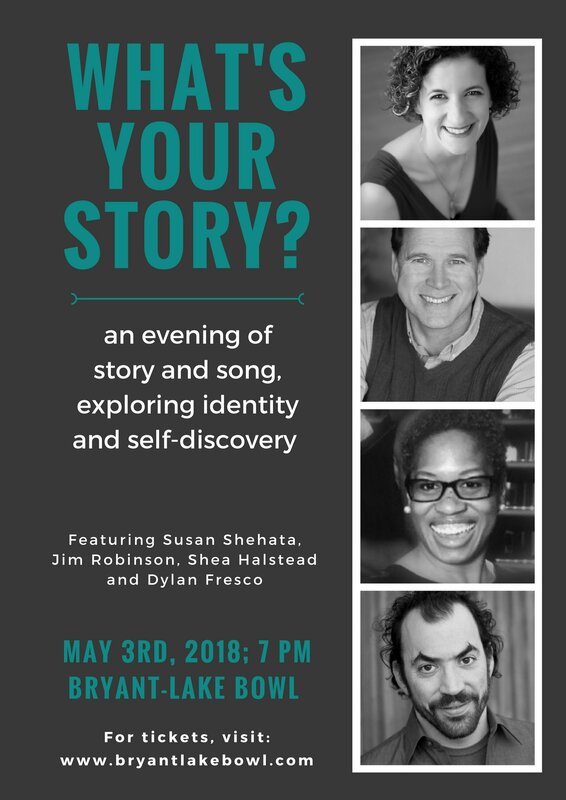 What’s Your Story?, was an evening of cabaret, featuring Susan Shehata, Jim Robinson, Dylan Fresco and Shea Halstead, exploring culture, race, ethnicity and sexuality. The performers share personal stories, poetry and music, to weave a collective web of identity and self-discovery. This show premiered at the Bryant Lake Bowl Theater in May of 2018.